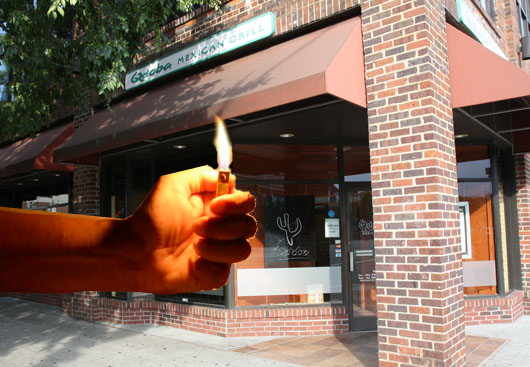 CHAPEL HILL, NC—Standing in front of the vacant Franklin Street storefront that used to hold Qdoba Mexican Grill late last night, sophomore stoners Chris Butler and Tim Marvin held a vigil to remember the recently closed restaurant. The vigil began on the back porch of Marvin’s apartment earlier that night. The pair, after smoking two bowls, were discussing possible places to eat. Holding up his lighter in solemn remembrance, Butler spoke first. He turned and motioned for Marvin to speak. “We are here tonight to honor Qdoba, we knew each other really well and I’ll miss you. Chipotle is way too far and isn’t open late. Plus the queso is dope here, I mean, was dope here…damn. We’ll just miss you,” Marvin said. The two decided to sit in front of Qdoba, trading stories of special moments they had experienced with the restaurant. Butler nodded his head and laughed a little, swallowing a sob. A large grumble emitted from his stomach, interrupting Butler. The two decided to get some I Love N.Y. Pizza quickly and continue discussing the matter. Butler, taking a large bite of his pizza, agreed.